PayPal is a handy tool for buyers and sellers, but it could also now help bring Apple Pay support to more businesses. Its PayPal Here card reader is designed as a cheap way for small or seasonal businesses to take payments on the go, as there are no monthly fees attached to it. The only other hardware that's needed is a smartphone or tablet with the PayPal Here app. 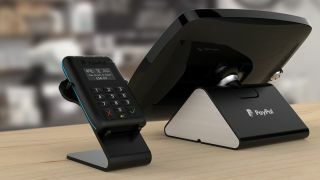 Version one of the card reader has been around for a while, supporting swipe and chip-and-PIN payments, but version two has arrived adding NFC support for contactless payments, including Apple Pay. You can already use Apple Pay in thousands of stores (anywhere with a contactless reader in fact) but with an affordable option like PayPal Here that number could grow substantially and move beyond major chains, allowing potentially any business to accept Apple Pay. Of course, being contactless, it doesn't just accept Apple Pay. You can also use it with Visa, Maestro and MasterCard credit and debit cards and there's every chance that it will support Android Pay once that launches. With big names like Apple supporting contactless at one end and the likes of PayPal helping sellers get contactless readers in their hands at the other, we could be on the cusp of NFC payments really taking off. By 2020 contactless payments could be available everywhere.